Calendar preparation time again- We need your photos! We have started to plan the 2016 year calendar. It is so nice to feature photographs of the cats and dogs that were in our care and who now have fantastic new homes with you. Hopefully you will have seen some of our previous years calendars and seen how nice they were. So we need your photographs please!! We need them at the latest by the end of June. It is always hard to choose which ones should go on the calendar as we get so many lovely ones. Please do send us good quality photographs of the cat(s) or dog(s) that you have adopted from us and preferably in a nice setting. We try to match the photos to the months/seasons- if at all possible(within our limited artistic abilities!). Please do not send us more than 3 photographs of each cat/dog that you may have had from us (a joint photo of course would be nice if you had a cat and a dog from us). Please do your own selecting before sending any to us for our final selection. 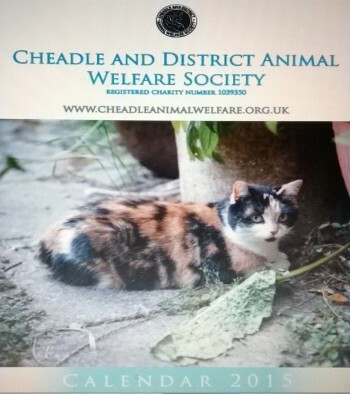 *** Email them to our hotmail address please which is -cheadleanimalwelfare@hotmail.co.uk by the end of June. If you can’t send them via email, you can leave hard copies (on photographic printer paper) marked for our attention at E + E Furniture Stores in the High Street, Cheadle please. If that is not possible please telephone 07531 232 542 to gain an address to post them to. We cannot guarantee to return your hard copy photos though I’m afraid. We look forward to receiving them soon.